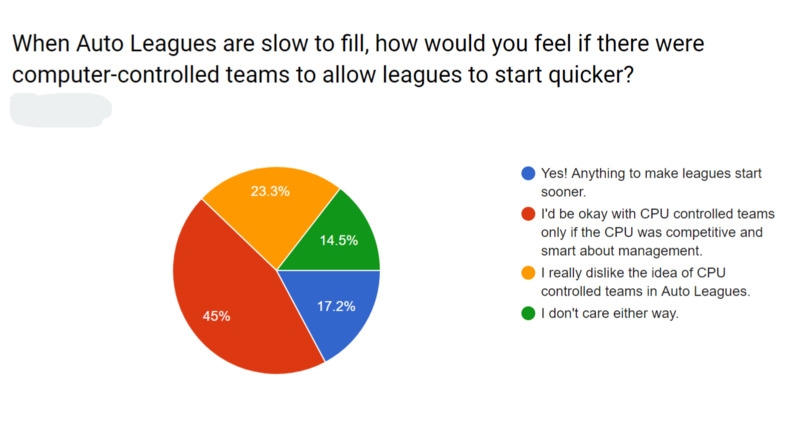 These three results are really interesting… people are clearly lukewarm on introducing CPU teams, which I can appreciate, but they really want to see more types of Auto Leagues. At the same time, they hate the idea of smaller leagues. 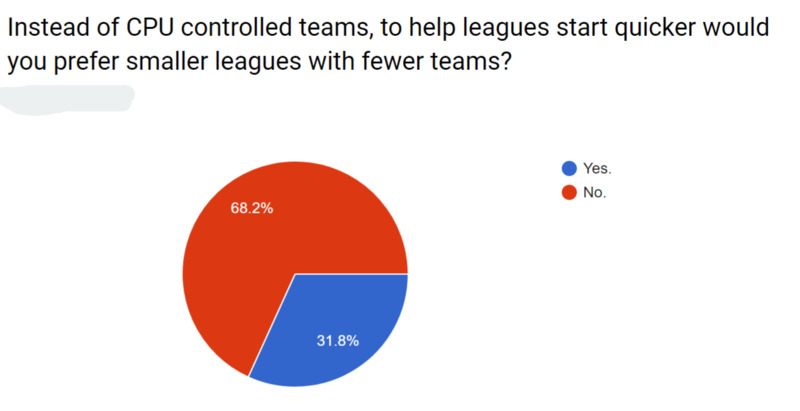 It shows how challenging this issue is - leagues are not filling fast, so introducing more types of Auto Leagues is only going to cause them to fill even slower. Yet people really want more leagues, yet they don’t want fewer teams. Maybe there’s a happy medium where at most we could have 1 or 2 CPU teams to help move things along. We did this before, but the CPU teams were really bad because it was thrown together pretty quickly. Here’s the thing about all the above results. It’s important for people to understand that a vocal minority of discontents tend to show on the boards, and when I make decisions, I have to consider a much larger, silent constituency. That’s why I do these “annoying” surveys (as some people called them) in the first place. That said, the vocal minority is still very important in calling out issues. 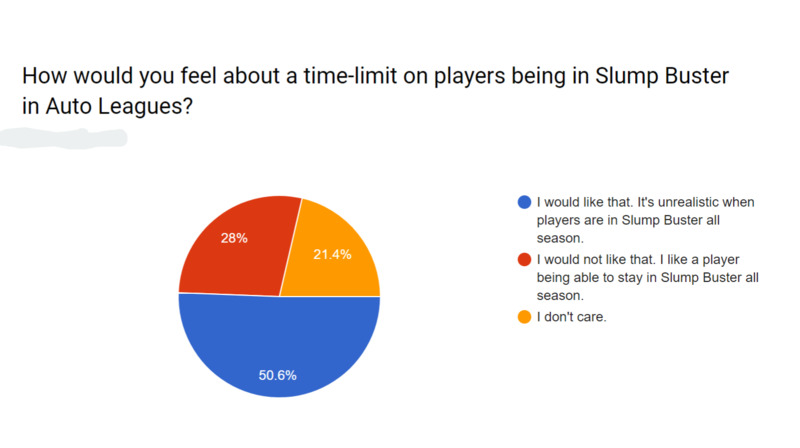 While most people thought the sim results were fine, there clearly was an issue with offense developing. Without people alerting me, it would be hard for me to know. But you can see that most people like Rank or don’t care either way. 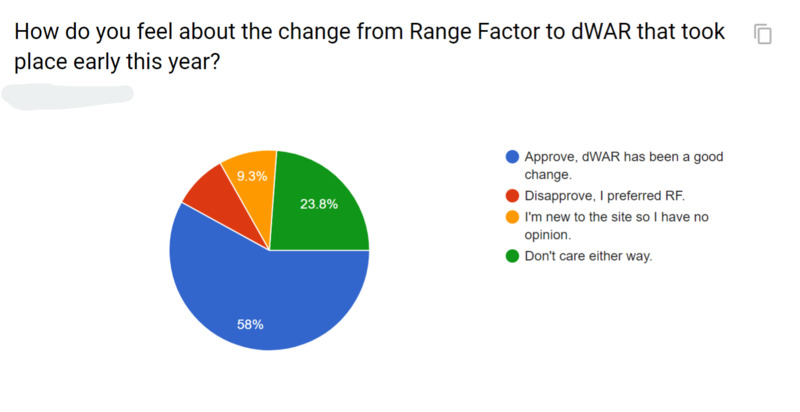 What was also fascinating is that the top reasons people like Rank are for the “better visibility” (52%) and “fairness to new players” (55%) which is not what I was expecting. Rank was first and foremost put in place to provide better leveling of the stats that matter, but only 34% of people cared about that. The other thing people really like is the improved balance in the Auto Draft and better team rankings for Supp Draft (both at 50%). So Rank has a lot of positive impact despite some people hating it. I think Rank has been important for a lot of reasons, but if I could do it all over again I would probably hide it so it wasn’t creating such an outroar or doing things like impacting trades. But you can see that it has quickly become an important thing to a majority of people. Is it always right to appease the majority? No, of course not. But this is one where I think it makes sense to find out what people really want. I’m not up for 60% of the site going crazy because I react and suddenly hide Rank from everyone. Finally, as for limited Slump Buster, it’s not exactly a run-away winner, because almost half of people don’t want it or don’t care. This one is tricky because there are two ways to look at it. Only 28% of people would be unhappy if I changed it, but it’s still only about 50/50 in terms of people who really want it. I’m leaning toward making this change because it makes sense in regards to realistic sim results. As for the verbatims, there’s a lot of interesting stuff in there, which will take time to read through entirely. One of the last entries was an “ad-free” site for a small monthly fee of $2. That just goes to show how much people don’t understand the reality of running this site. The monthly fee would absolutely have to be more than $2, and thus very few people would participate, which is why monetization is such a challenging issue, and why we all have to deal with ads. As for “themes” - there were a lot of suggestions around more managerial control. This was probably the biggest “group” of suggestions. I can appreciate all those, and I’ll simply do what I can in that arena - it’s an area of endless possibilities and lot of work, so it’s a tough area to make progress, but there are some obvious wins we could have there. There was a lot of feedback about players not playing up to their Real Stats. This is one of the hardest things about running a site like this, people don’t understand the zero-sum reality and that nobody is going to play close to real stats in most of the types of leagues offered.